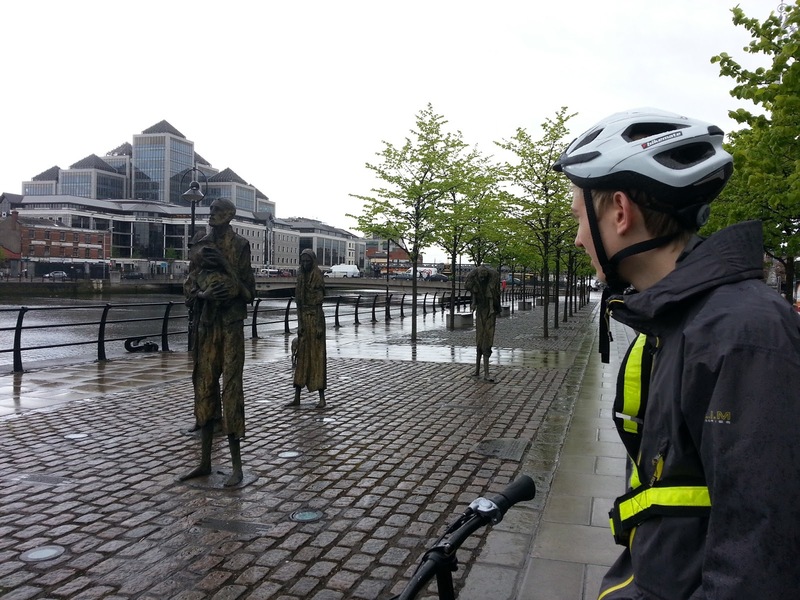 Can you call a cityweekend trip to Dublin an adventure? Well of course! An adventure is about discovering new things and exploring the world - so definitely an adventure! 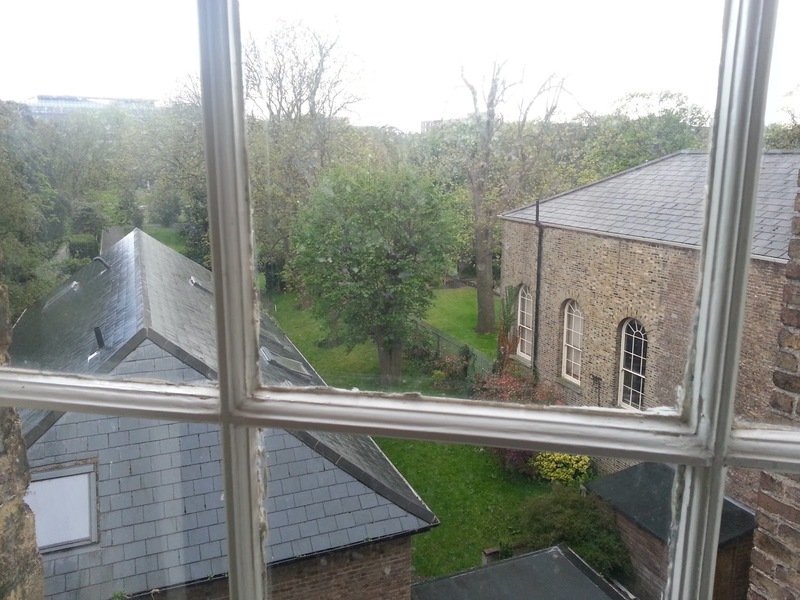 Dublin is a great city - the size is perfect since everything is within walking distance. People are friendly and there are lot's of sights and history to explore. Of course we did the usual stuff - shopping, walking, walking, walking, eating, visiting pubs, sightseeing, visiting museums, just relaxing and then some more walking. Since this was a trip for my 15-year old, he decided the tempo and activities. A couple of times I left him in the hotel room and did some shopping of my own! So, here are some of the highlights - and also things that qualify very well as adventures. 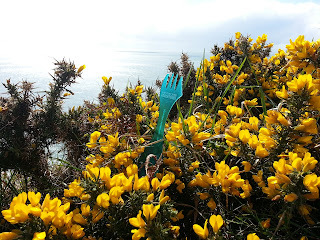 There are lot's of tour companies in Dublin, the hop-on hop-off buses, other bus tours, plenty of walking tours and of course the strange/fascinating/unique/appalling (you choose!) Viking splash tours... But we decided to go on a bike tour. We did that last year in Berlin and thought it was a great way to get a good understanding of the city and the history. 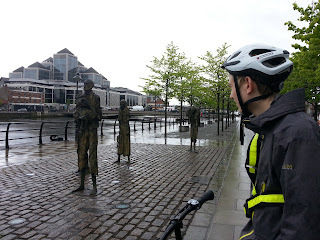 We booked our tour with Dublin Bike Tour and walked to the meeting point on a rainy Thursday. There were only 3 of us going on the tour together with our charismatic guide Brian. 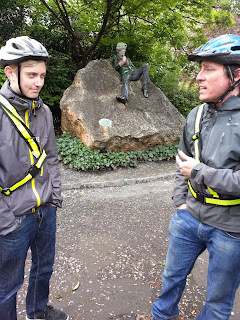 We had a great morning with Brian who showed us the main sights in Dublin and at the same time gave us information about the city and the history. Both informative and entertaining! I think this way of seeing the city is actually better for a teenager then just riding the bus which can get a bit boring. So we were both happy with the start in Dublin! When we were approaching the airport on our way to Dublin, we could see Howth when looking down through the plane window. And Casper said "It would be great to go there" - so of course we had to do that! Howth is only about 25 minutes from Dublin on the DART (commuting train). Howth itself is a pretty seaside village with a harbour, piers and plenty of seafood restaurants. 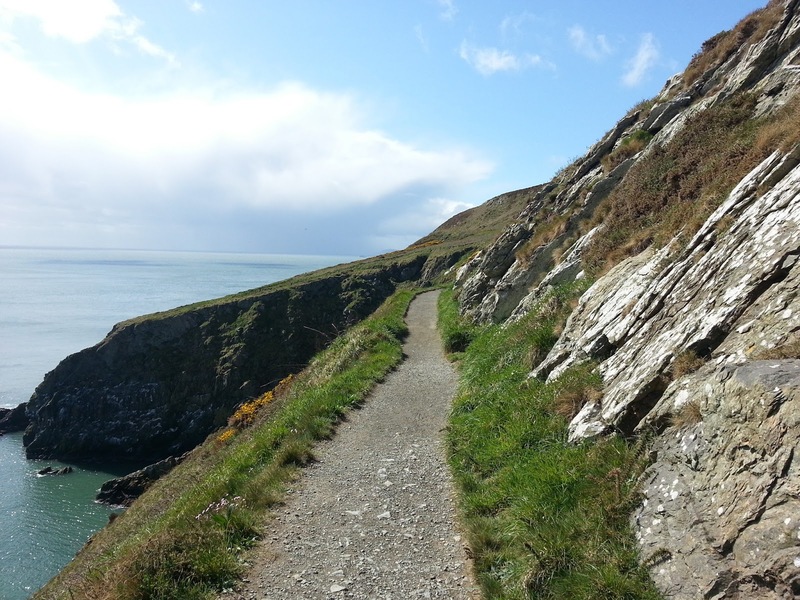 Many people come here to go hiking on the trails around Howth's head, and so did we. We took a short trail which was about 7 kilometers which took a couple of hours. It was a great walk with nice scenery. There are four prepared loop walks, and we went on the Tramline loop. It was a windy day with mostly sun but also some showers. Typical Irish weather! When we got back into Howth we celebrated with a nice lunch at one of the many restaurants before heading back to Dublin. 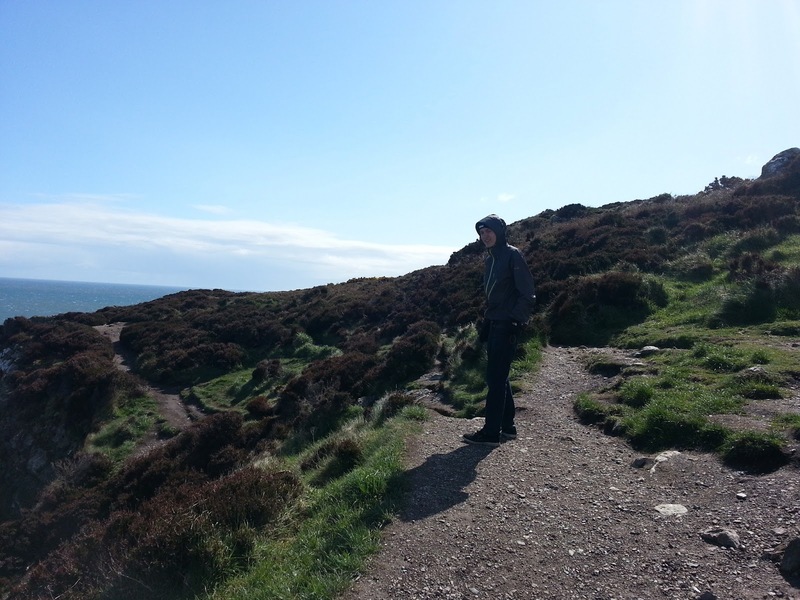 We can really recommend this as a short adventure when you are in Dublin - the hike is easy with spectacular views. Iveagh Cache - was only 68 metres from our hotel room! Located in a very nice and secluded park. Gardiner's Treat - a webcam, and nice since there are not that many webcams left since you are not allowed to create these types of caches anymore. Radio Ga Ga - the only cache we logged on our trip to Howth. 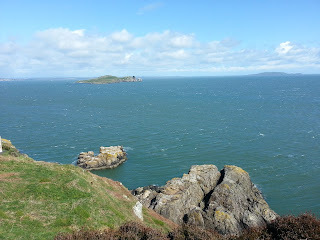 Amazing view of the sea and the harbour in Howth. 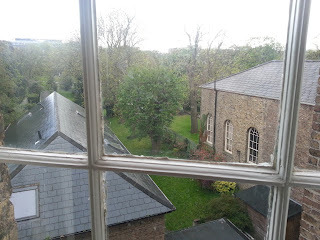 View from our window where you can almost see the Iveagh Cache. That's it! Both of us had a great time exploring Dublin and it was nice to have some time together just the two of us. Stay tuned for Adventure #4.2 - Cityweekend in Moscow.